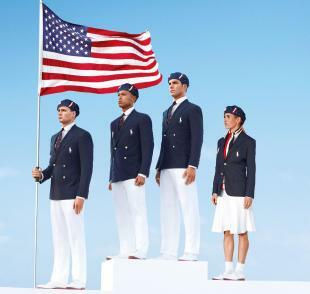 They are the pride of America - Team U.S.A. - and for the opening ceremonies of the Summer Olympics in London, they'll be proudly wearing red, white and blue, from beret to blazer. The classic American style - shown in an image above - was crafted by designer Ralph Lauren. But just how American is it? When ABC News looked at the labels, it found "made in China." Nanette Lepore, one of the top U.S. fashion designers, said she was shocked that none of the uniforms had been made in the states. Further, Lepore said that it was "absolutely" possible that the athletes could have been outfitted in U.S.-made clothing. She said U.S. manufactures could have easily made the uniforms - and for less. "Why shouldn't we have pride not only in the American athletes, but in the American manufacturers and laborers who are the backbone of our country?" Lepore said to ABC News. "Why? What's wrong? Why was that not a consideration?" The committee said: "The U.S. Olympic team is privately funded and we're grateful for the support of our sponsors. We're proud of our partnership with Ralph Lauren, an iconic American company."